We have heard from Kellen as to why he is already missing the One (M8)’s camera thanks to a few of its features, but the Galaxy S5 shooter is nothing to mess around with. While HTC did a great job at marketing the One’s somewhat gimmicky features, the camera leaves a whole lot to be desired, especially in regards to editing photos after the fact, as well as overall picture quality. As stated in the previous 5 Reasons post, the One’s UltraPixel sensor does do a fine job at creating photos that are share worthy on Instagram and Twitter, but for anyone looking to get more out of their photos, 4 megapixels probably won’t cut it. After our time with the Galaxy S5, we have compiled another five reasons which make the shooter on Samsung’s newest flagship device better than the one found on the HTC One (M8). More pixels means more detail. Regardless of which team you might be rooting for, Samsung or HTC, we can all no doubt agree that when dealing with megapixels on smartphones, more is sometimes, but not always, better. In comparison to the HTC One (M8)’s UltraPixel lens, which totes a 4MP sensor, Samsung threw in a 16MP sensor, allowing the phone to take not only larger resolution photos, but photos with more clarity and detail. As we found when reviewing the One (M8), after photos are uploaded to the computer, they lose an insane amount of crispness and detail. On the Galaxy S5, photos retain their value once transferred off of the device, allowing for more editing and cropping for those which need it. 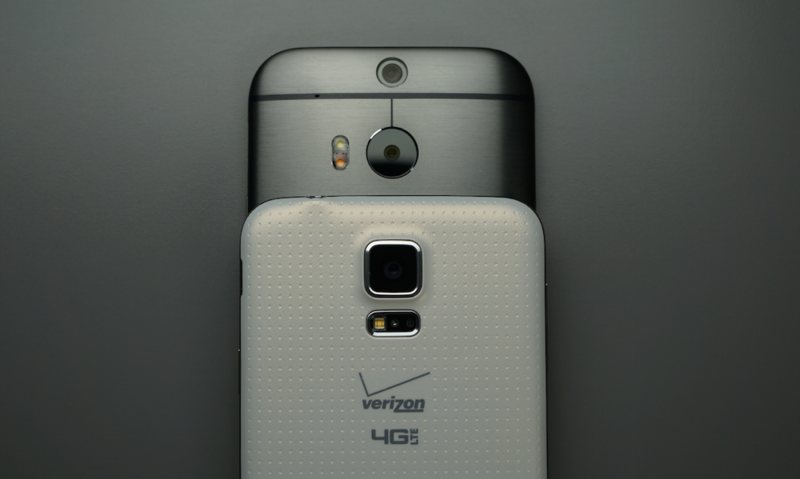 Hate it or love, the Galaxy S5’s camera is easily the more versatile of the two. Selective focus with just one lens. The One (M8) boasts a UFocus feature, which allows the photographer to go back in time essentially, refocusing a photo which has already been taken. If you snapped the foreground, and want to go back and refocus on the background, you can do so. Using proprietary software, and not needing two cameras, Samsung allows for this same effect. I would even go so far as to say Samsung did it better. When Selective Focus is enabled, you snap a picture, allow it to process, and then you are done. At that point, you can choose in the Gallery app whether you want a near focus, far focus, or a pan focus. Comprehensive photo and video settings. While the HTC One (M8) does have a simplified and well laid-out user interface, the Galaxy S5 features a UI with a mountain of settings. With a ton of different smart modes to choose from, plus even more that are downloadable, users will have no problem finding a settings that fits any type of situation. Beyond just Smart Modes, Samsung allows users to tweak individual attributes of a photo, such as the ISO, picture’s size, Metering mode, white balance, exposure values, and even more. Audio zoom during videos. When recording videos on smartphones, depending on your surroundings, it’s easy to pick up a ton of unwanted sound. The Galaxy S5’s Audio Zoom setting looks to diminish that issue, allowing users to select a single point of focus for the device’s mic. For example, if you are at a concert, you will select the stage as the area you want the mic to focus on, leaving that noisy crowd behind you lower in the audio mix. It may seem like a meaningless setting among a sea of others in the menu, but when the time comes, you might be glad you have it. Customization of the camera UI. A feature which I didn’t even know existed until recently is probably one of my new favorites, which is the ability to create custom shortcuts on the actual camera’s UI. For example, the Galaxy S5 out of the box features shortcuts for Selective Focus and HDR+. If you don’t use either of these very often, you can long press on the icon, and then replace it with any other setting from the menu. For example, I changed my shortcuts to Flash, Metering mode, and kept the Selective Focus. It may be something you will only use once or twice during your life with the device, but saving users the time of digging through the extensive settings menu is a blessing. To see more in-depth looks at these 5 features we have a full explanation in the video below.